Blue Gal: Salon tonight here's the link again. Salon tonight here's the link again. Salon is here. 9 PM Eastern. Download Skype here first if you haven't already. 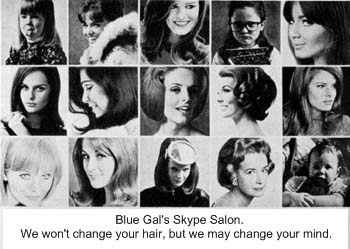 On Monday evenings, I participate in Blue Gal's Skype salon. It's a fun, chatty, exchange on all sorts of topics. 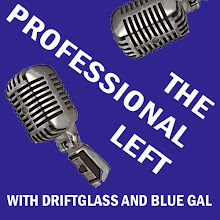 Nothing like a bunch of brainy, language freaks and political junkies in one place, all talking at the same time. It's done in real-time chat, though Skype has voice over internet capability for free - how cool is that? But for all these not-shy, mouthy people, the voice over seems hard to manage without it sounding like the monkey house at the Lincoln Park Zoo. She says that like it's a bad thing? No way. I won't touch C.R. poem, but I'd like to say thank you for the link! Am I in the right room? It says "All other participants have left the chat." I am completely geeking out here. There are no stupid questions, right? Monday Vlog: Blue Gal THUMPS her Bible! Monday Vlog: Blue Gal being bad? Department of "okay, I'm a feminist after all"
How exactly do I respond to this? Yeah, yeah, yeah, I read Oprah. We don't talk about the weather at Salon, okay? This is not a knitting vlog, really. Funniest thing I didn't read all summer. How the General's manhood measures up. I knew there was a reason I love these guys. Great night for Dennis the K.
It's about time something like this happened! You think we've got it bad here. He doesn't look a day over 19. Damn right we need to watch this again. Song for those of us blessed with butts. Okay, so Sandy said it better than I will. Boomer chic or sign of the times? Splainin' to do. Salon tonight. Which David do you love to hate the most? Pffft. I loooove buyin' me some books.